PLAYBULB Colour RGB LED Lightbulb + Bluetooth Speaker + App UPDATE! to pledge now and you will receive a link of your own after you make your pledge! Refer your friends and family to help spread the word for One Card, and get your OneCard for free! You will receive 10% back from anyone that backs One Card from your referral link. If you refer enough people that back One Card you will start getting the 10% back to your paypal!. Use this link http://igg.me/at/onecard/x/6977583 to pledge now and you will receive a link of your own after you make your pledge! Even though this is not a Homerun or backers, its a good start to show creators that they have an obligation to answer to the backers. Creators must now show in detail how the funds have been used and why they couldn't complete the project. Get it for free!, or at least save some money on your pledge! 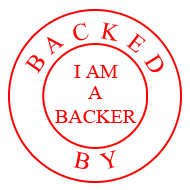 Simply back them with this link, then you will receive your own link, share it and for every backer you can get refunded for the money you spend on MaximusLife! All you have to do is get friends to get excited & contribute to Maximus and you receive $1, $5, $15 or $20 back on friend referrals. (That is the cost of Maximus!) Back them now and share our link as well! Get a Pelty for free, or at least some extra candles! Simply back them with this link, then you will receive your own link, share it and for every backer you will get free candles, after you reach 10 or more you will receive a free pelty! back them now and share our link as well! Get it free or at least save some money when you share it with your friends. Back it through this link and then you will receive your own link that you can share with your friends and for every Sensibo pledge you get $20 off your pledge! Back them now and get it FREE! Get it free or at least save some money when you share it with your friends. Back it through this link and then you will receive your own link that you can share with your friends and for every ChargeAll pledge you get $10 off your pledge! Back them now and get it FREE! iFind Alleged Scam raised $500k and Still Funding! Bring Reading Rainbow Back for Every Child, Everywhere.